Transparency Market Research(TMR) has found that the leading three players in the U.S. and EU-5 prefilled syringe small molecule market, Sanofi, Teva Pharmaceutical Industries Ltd., and Mylan N.V. held a whopping share of 70% in the market in 2015. Copaxone, a popular drug brand launched by Teva is responsible for the company’s dominance. A majority of the leading companies in this region are striving to make a mark upon the market, by adopting strategies such as product launches through investments in R&D activities. According to the lead analyst at TMR, “With a view to establish themselves securely in the market, several pharmaceutical firms are endeavoring to develop large molecules as well as a strong product pipelines”. 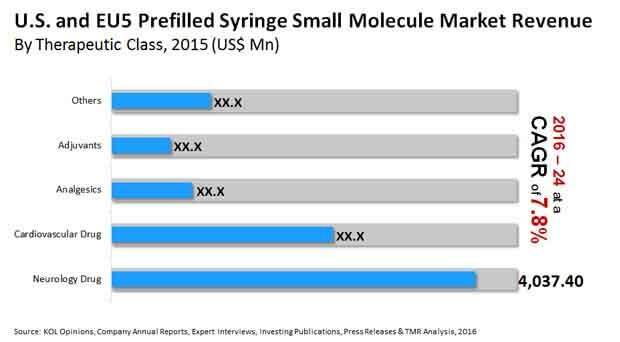 The findings of TMR reveal that the prefilled syringe small molecule market in the U.S. and EU-5 was pegged at US$9.15 bn during 2015. By the end of 2024, the market is slated to achieve revenue worth US$17.1 bn, expanding at a CAGR of 6.0% to 8.0% between 2016 and 2024. By therapeutic class, the neurology segment is likely to lead the market, selling nearly 40.3 million units by 2024. Based on geography, the U.S. is likely to account for a share of 68.3% of the prefilled syringe small molecule market in the EU-5 and the U.S by 2024, states TMR. The U.S. is slated for substantial growth over the forthcoming years, and therefore is expected to dominate the regional scenario. The rising incidence of neurological and cardiovascular disorders, coupled with high frequency of emergency situations, which require accurate and safe dose delivery, has promoted the adoption of small molecule prefilled syringes. As a result, the cardiovascular small molecule prefilled syringe segment represented a share of 26.91% in the U.S. and EU-5 prefilled syringe small molecule market. The presence of a large number of leading market players in the U.S., such as Dickinson, Mylan, Teva, Pfizer, Fresenius Kabi, Sanofi, and Becton will ensure that the region will retain its dominance over the forecast period too. Moreover, the demand for adjuvant small molecule prefilled syringes might escalate over the next few years owing to the large number of vendors in the market. Due to the recent technological advancement in the area of prefilled syringe small molecules, the market has gained significant impetus. The introduction of advanced drug class in the market has been opening up avenues for further expansion. For instance, Glotapa, a new drug for the treatment of multiple sclerosis launched by Sandoz, received FDA approval in 2015. The market is ripe for more product launches and approvals, boosting the growth of the prefilled syringe small molecule market in the U.S. and EU-5. The demand for prefilled syringes will soar, thanks to the elimination of the need for trained medical professionals and hospitals. Consequently, the increasing number of patients can perform injectable drug delivery by themselves at home. Unavailability of generic drugs is also expected to drive growth. However, as the development of these drugs requires large investments, the smaller and medium-sized firms might face monetary risks and stability issues. This might slacken the growth of the market. However, the effect of this restraint can be outpaced by the changing disease management approaches and the emergence of point-of-care administration. The information presented in this review is based on a Transparency Market Research report, titled, “Prefilled Syringe Small Molecule Market (Therapeutic Class - Neurology Drug, Cardiovascular Drugs, Analgesics, and Adjuvants) - U.S. and EU-5 Industry Analysis, Size, Share, Growth, Trends, and Forecast 2016 - 2024”.